Tuscan Ridge is a prestigious development surrounded by citrus and pine forests. Our spacious private villa is 15 minutes from Disney World and close to golf courses designed by top professional golfers including Greg Norman. The villa enjoys views of open conservation land and extensive woodland. 8 mins from numerous restaurants, bars and mini-golf etc.We have a larger than usual pool area with lanai and it is not directly overlooked by other villas. A parent of 3 grown up children we Visit reguarly and absolutely love the area around Orlando. We have visited beaches, state parks, nature reserves and of course Disneys fabulous attractions. We recommend Discovery Cove and love Cracker Barrell restaurant for real American breakfasts. The villa is quiet and the pool is not overlooked which is good when families visit either with small noisy children are the larger variety! There are some wonderful state parks where there is swimming, barbecues etc and the 'nature coast' excellent beaches on honeymoon island within 1 half drive away. We love America as we used to live there, missed it very much and this is our own way of including the US in our lives. We love the peaceful position of the villa and the privacy of the pool. Our villa has a pool that is not overlooked,as we look onto the nature reserve which has eagles and other critters living there. It is peaceful, private and therefore we can play music (not too loud though!, laugh and swim without being observed in any way. Carpeted with an armchair and 2 comfortable sofas (1 which converts to a double sleeper sofa, occasional furniture, CD/radio/tape player. The second lounge adjoins the fully equipped kitchen and separate laundry room. The kitchen is fully fitted with cooker, microwave, dishwasher, American fridge/freezer with ice-maker, toaster, kettle, coffee maker, food processor, crockery, utensils and telephone. There are several championship golf courses close by, including the new Champions' Gate resort with courses designed by top professional golfers including Greg Norman, only a 6 minute drive away. N ot overlooked by other villas. Lovely spa pool can be heated. Notes on accommodation: The extended deck and double lanai area faces SW so benefits from a very sunny aspect. Tables, chairs and loungers overlook the large pool with additional safety feature of a portable pool fence which can be clipped around the whole water area. The pool area offers peace and privacy to our guests. Games room is equipped with 8ft professional slate billiard/pool table, football table and dartboards. Outside: Private pool is not overlooked and has beautiful views over conservation land and woodlands. Sunny aspect and peaceful location. Utility Room: With washer, dryer, airer and ironing board. Cleaning / Towels / Linen / Maid service: Towels and linen are included. Other: Family room, with 2 comfortable sofas and armchair. New TV DVD player, iPod dock, board games, books and toys with double doors to pool area with views to woodland. Large open dining area seats 6, with full table settings. Safe is provided. We loved the privacy of this home. We did have to buy more hand towels and washcloths, as well as kitchen dishcloths, as there were not sufficient supplied. There were no written instructions concerning when garbage and recyclables had to be put out, and we felt the house itself could use some TLC. We did like the neighborhood and the location, though. We are happy that you lived the location and privacy our holiday home offers. Sorry about the towels and wash cloths and I will immediately look into where they have gone. Our linen cupboard is usually stocked up. I will also make the garbage collection clearer for guests. Only one and half hour's easy drive to St Pete's beach and Clearwater beaches. Car hire or use of car is recommended. The villa is 12-15 minutes from Disney world. 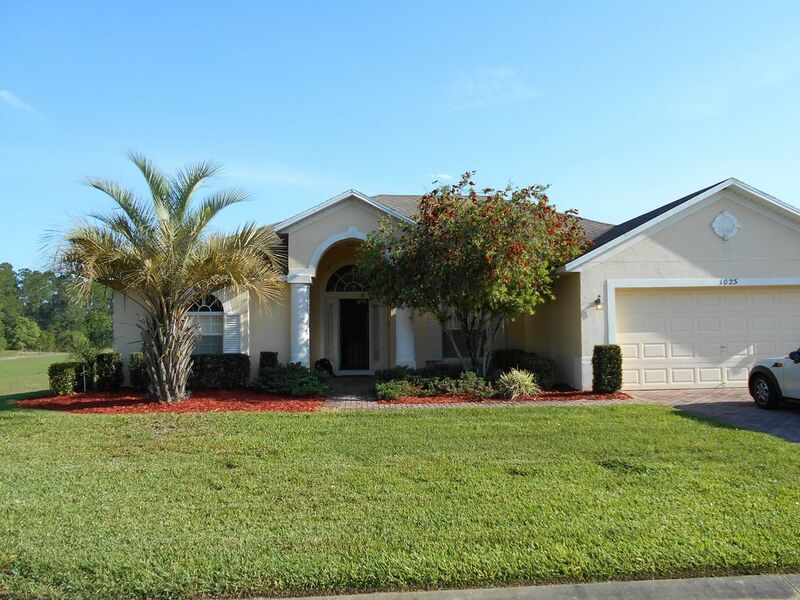 30 minutes from Orlando International Airport and 60 minutes from Sanford and Tampa International Airports. The busy 192 road with numerous restaurants, bars, mini-golf etc. is only 8 minutes away. Facilities nearby include a Walgreens store and pharmacy (3 minutes) Publix supermarket, several restaurants and a new Walmart superstore which is 9 minutes away on the Highway 27. Plus many other new department stores close by. Booking Notes: Deposit of £100 per week will secure the booking and full payment must be paid 4 weeks at the latest before arrival at the villa.